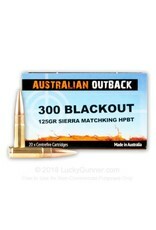 This 300 Blackout cartridge by Australian Outback features a 125 grain Sierra MatchKing hollow point projectile. The MatchKing is an exceptionally accurate bullet owing to its very thin jacket drawn to an exacting concentricity standard of 0.0003 in maximum variation as well as its carefully controlled weight uniformity. This bullet differs from the majority of MatchKings in that it has a flat base rather than a boat tail design -- its base is specifically designed for optimum supersonic performance in the 300 Blackout caliber. The bullet’s hollow point will cause it to create a wide wound channel upon impact, making it a marvelous choice for hunting. 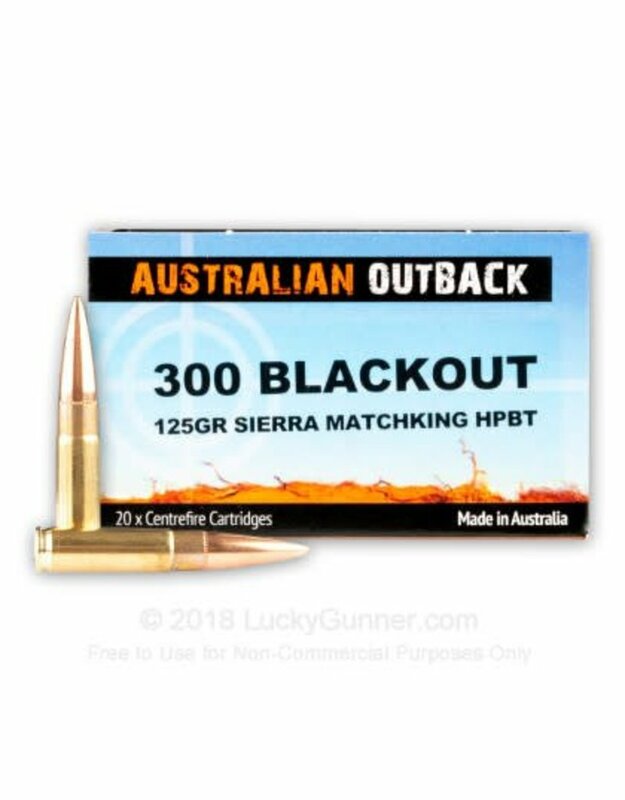 This cartridge features Australian Outback’s Ballistic Temperature Independence technology, which means it will reliably deliver a consistently high muzzle velocity regardless of the extremely high or low temperatures you fire it in. It further offers a clean burning powder which will leave your action clean for longer in between cleanings.